The other day I was watching an episode of Judge Judy when one of the litigants talked about someone harassing her using an Internet "meme." She pronounced it Me Me, instead of how I'd always thought it was pronounced, MEEM. So I immediately started worrying -- was I the one mispronouncing it? Granted, it doesn't come up in conversation often, but had I been throwing around this word incorrectly all this time? Thankfully, a quick double-check online verified that I was the correct one (for once). 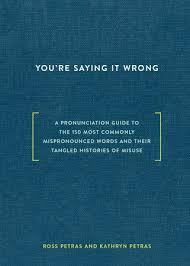 If you've ever been in the situation of worrying about the correct way to pronounce words, then the book You're Saying it Wrong by siblings Ross and Kathryn Petras is a book you'll want to keep handy. The book begins with a short history of "shibboleth words." These are words which are used in one language or culture, but might be difficult for an outsider to pronounce. It has been a way of weeding out invaders and imposters throughout history. The book takes a look a large group of words (including not only words in everyday usage, but also names, and quite frequently culinary terms) and looks at their origins, definitions and even helpfully lists some common mispronunciations so that you can see if you fall into one of those categories. The authors have based their conclusions by consulting many dictionaries, journal articles and Internet sources, but for the purposes of this book, they are favoring American pronunciation. Each entry begins with the word, a short definition, and a pronunciation guide that is mercifully easy to follow. No weird upside-down "e" characters or other strange letters or accent marks. The pronunciation of mischievous, for instance, is written out as Mis-chuh-vus. There's even a slightly off-color joke told about how to remember to pronounce the Vietnamese dish "pho" which will brand it forever in my memory! Worryingly, I came across several examples where my own mispronunciations were pointed out, such as mascarpone (look how far along the word you go before you hit an 'r') and ophthalmologist (the oph is pronounced like "off" -- who knew?). All in all, while it's a subjective group of words, I'm sure nearly everyone will find words that they have been pronouncing wrong or have never learned how to pronounce in the first place! If you're interested in word origins or language, you will enjoy paging through this useful little book.